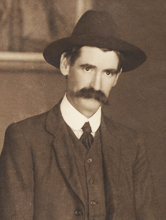 Henry Lawson was born at Grenfell, New South Wales, in 1867. He was educated briefly at several schools, but was sometimes kept home by his father to help with his carpentry. At the age of nine Lawson experienced problems with his ears and suffered partial deafness for the rest of his life. Lawson worked for his father until 1883 when he joined his mother, Louisa, in Sydney. He worked as a coach painter and assisted his mother with her periodical, the Republican, in which Lawson published his first prose piece. His first poem, A Song of the Republic, was published by the Bulletin in 1887. During the 1890s Lawson wrote his most admired work. His first collection of prose and verse was published by Louisa Lawson’s Dawn press in 1894, but his reputation was sealed in 1896 when a collection of his short stories, While the Billy Boils, and an anthology of his poetry, In the Days When the World Was Wide, were published by Angus and Robertson. Lawson became, for many twentieth century critics, the personification of Australian literature. He married Berthe Bredt in 1896 and they travelled to New Zealand and England while Lawson attempted to attract more financial reward for his writing. Joe Wilson was largely written in England and published by Blackwood in 1901. Following their return to Sydney in1902, Lawson lived apart from his family. He spent time in gaol for failing to pay maintenance and became a well-known vagrant in Sydney. Lawson continued to write prose and poetry, but this work remained far beneath his earlier levels of excellence. In 1920 a pension from the Commonwealth Literary Fund provided some financial security. Henry Lawson died of a cerebral haemorrhage in Abbotsford in 1922.